Just like the mythical creature, 2017 Panini Phoenix Football is reborn for another year, again focusing on the top incoming rookies. Every hobby box includes a rookie autograph jersey card plus another signed insert and a memorabilia card. The debut set in 2016 established the blueprint for Phoenix, but this year provides more specific expectations for the box hits. 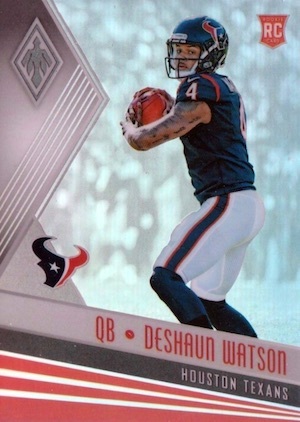 The primary base set includes rookies at a rate of one per pack, as well as several parallels. New this year are Color Burst parallels that come in hot packs which average one per box. 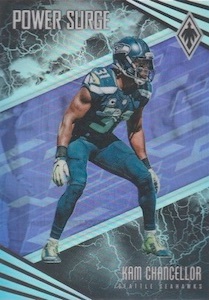 Collectors will know as soon as they uncover it since every card in the pack showcases the bright coloring. 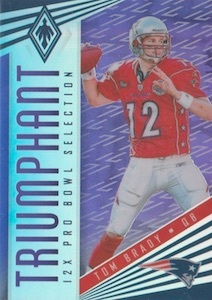 Combining to come nine per box, the 2017 Panini Phoenix Football inserts feature Power Surge for top players on defense, and the Tom Brady-based Triumphant set honoring key points from his amazing career. 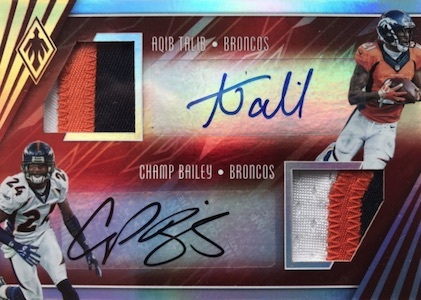 Getting to the good stuff, the Rookie Autograph Jersey subset tackles the first-year stars at one per hobby box. 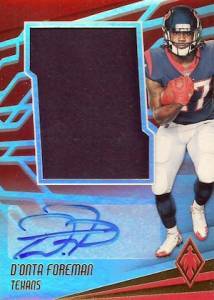 The 2017 Panini Phoenix Football checklist also includes RPS Rookie Jumbo Auto Swatch (#/149 or less) versions, with low-numbered Tag, Brand Logo and NFL Shield parallels. These oversized auto relics average three per inner case. 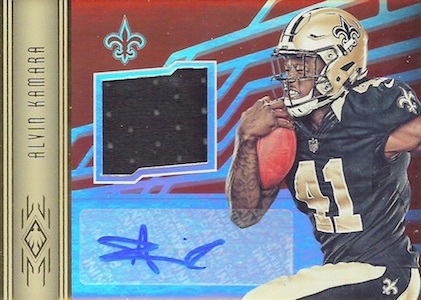 Other options for the young stars come with Hot Rookie Materials Signatures. Former greats also get the call thanks to Retired Signatures. 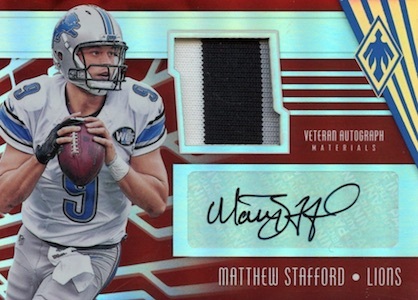 Highlighting multiple players, Dual / Triple Patch Autograph cards fall around one per case. 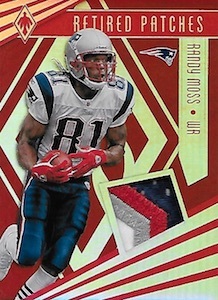 Acting as one of the three box hits, the relic inserts include RPS Jumbo Memorabilia cards for the rookie players with rare parallels like the one-of-one Nike Swoosh Super Prime. ZAY JONES 2017 PANINI PHOENIX ROOKIE RC PATCH AUTOGRAPH AUTO #'D 77 150! BILLS! View available 2017 Phoenix NFL autographs on eBay. PARALLEL CARDS: Color Burst, Red #/299, Pink #/199, Purple #/149, Orange #/99, Yellow #/75, Green #/25, Black #/10, Blue 1/1, Printing Plates 1/1. PARALLEL CARDS: Orange #/150 or less, Yellow Prime #/49 or less, Green Prime #/10, Blue Super Prime 1/1, Laundry Tag Brand Logo 1/1, Laundry Tag NFL Players Logo 1/1, Laundry Tag NFL Shield 1/1. PARALLEL CARDS: Orange #/49 or less, Yellow Prime #/25 or less, Green Prime #/5, Laundry Tag #/3, Brand Logo #/2, Blue Super Prime 1/1*, NFL Shield 1/1. All subjects not included in Blue Super Prime parallel*. View specific options with the spreadsheet. 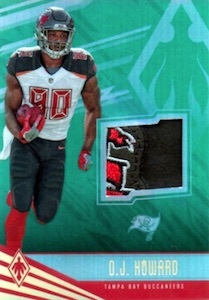 PARALLEL CARDS: Gloves #/99 or less, Helmet #/49 or less, Helmet Logo #/10 or less (No Kizer,Perine*), Vapor Jet #/2, NFL Shield 1/1, Nike Swoosh 1/1, Team Logo 1/1. 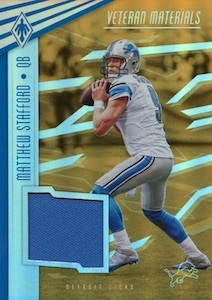 PARALLEL CARDS: Super Prime 1/1 (No Rodgers*). 40 cards. Serial numbered #/79. Shop on eBay. PARALLEL CARDS: Orange #/49, Prime Yellow #/25, Prime Green #/10, Super Prime Blue 1/1. JUMBO PARALLELS: Jumbo Base #/79, Orange #/49, Prime Yellow #/25, Prime Green #/10, Super Prime Blue 1/1. PARALLEL CARDS: Orange #/25 or less, Prime Yellow #/10 or #/5, Prime Green #/5 or less, Super Prime Blue 1/1. PARALLEL CARDS: Red #/299, Pink #/199, Purple #/75, Orange #/49, Yellow #/25, Green #/10, Blue 1/1. 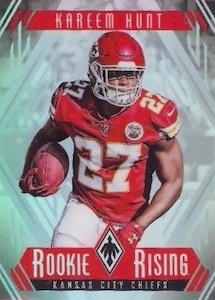 Everything that Panini got right with Xr, they got wrong with Phoenix. Pros: Nice variety of hits. Beautiful card design. Year 2 of Phoenix provided much needed improvements from year 1. Good mix of base, parallels and hits at a lower price point. Cons: #’ed cards have the number on the back of the card. Year 3 hopefully will bring #’ed cards to be numbered on the front. Basic design seems to be a mix of Spectra and Unparalleled. Love the look of the base cards. Great color variations and delicious inserts. 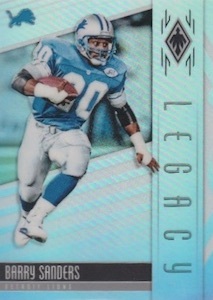 Would like to see better patches on the lower print RPA’s and of course the loss of stickers would be nice. Overall a fun product to open! As an Eagles fan I find this set lacking in substance. Just opened my 1st box…..WOW. Love the chrome look. 15 numbered cards. 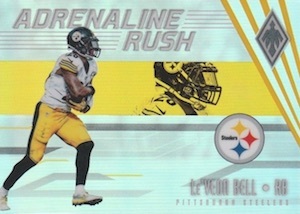 One of them was a Le’Veon Bell black numbered to 10! Got Mack Hollins yellow patch auto to 49 with part of the eagles head. 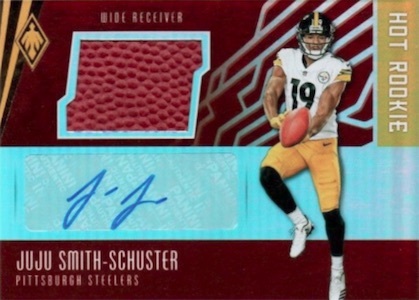 JuJu Smith-schuster Green Prime patch Steelers Logo to 10 and a Jason Witten Veteran autograph materials redemption that will be numbered to 20. Will be buying more soon.